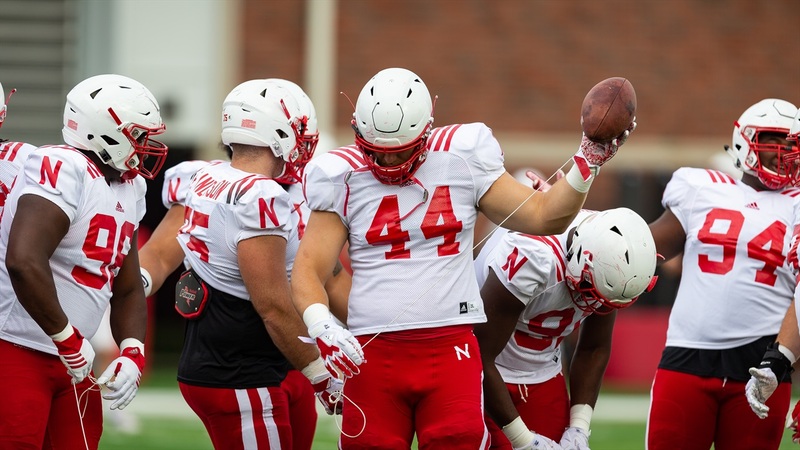 Nebraska football was back at it on Tuesday following a day off after Sunday's scrimmage. Here's some of what the Hail Varsity team –– Erin Sorensen, Jacob Padilla, Derek Peterson and Greg Smith –– noticed from today's practice. >> Nebraska practiced inside the Hawks Championship Field on Tuesday due to rain. >> True freshman Adrian Martinez was the last quarterback to exit the practice facility after practice, and Coach Scott Frost was right there with him and in his ear all the way down the tunnel. >> Defensive backs coach Travis Fisher mentioned a handful of players by name in terms of standouts from Sunday's scrimmage, but he made sure to mention that although junior cornerback Lamar Jackson played well, though he did miss one tackle that he would have liked to have back. >> Senior outside linebacker Luke Gifford's leadership continues to draw praise. On Tuesday, sophomore outside linebacker Breon Dixon singled out Gifford as a guy that took him under his wing after the Ole Miss transfer arrived in Lincoln. >> Multiple players today talked about the mentality needed to play at a high level. There were multiple references to not just playing well for a couple plays but every play. They are sounding like their coaches and thats a good thing. >> Tom Osborne was at practice again today. He was in a sharp suit too. >> Dixon was tired and out of breath when he met with reporters. He apologized a lot for it but said the team had just gotten done running. >> First words out of senior defensive lineman Freedom Akinmoladun's mouth when he got to the second floor? "I'm tired." >> Dixon had his list of suitors down to three schools when he picked Nebraska: Michigan, Wisconsin and the Huskers. He said he looked at Big Ten schools mostly, adding that he feels the Big Ten is about as close to SEC as any other conference. >> Deontai Williams listens to Bob Marley to get his mind right. New favorite thing. >> Outside linebacker coach and special teams coordinator Jovan Dewitt said freshman kicker Barret Pickering has separated himself at kicker. Lightbourn is handling kickoffs, but Dewitt noted Pickering has a strong leg and has been fairly accurate in practice. >> Central Florida grad transfer Tre Neal said Nebraska's current practice looks and feels exactly like the UCF practices under Frost. >>The defensive line calls Akinmoladun "Freak-inmoladun." When asked for the specifics behind the nickname, Akinmoladun said he wouldn't address it. "Freedom is already a unique name." >>When presented with a choice, Gifford selects purple Gatorade every single time after practice. It's also an unrelated coincidence that Nebraska serves the "Gatorade Frost" flavors.